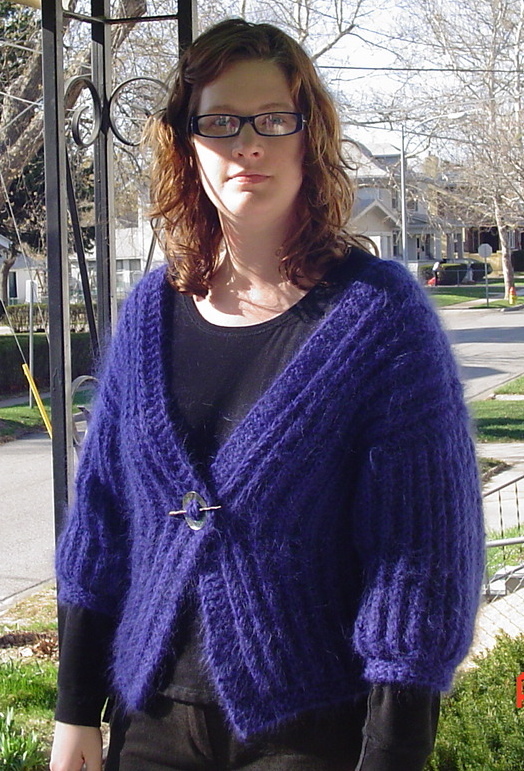 I’ve finally finished the Lavender Jacket, otherwise known as my grover cardigan. This was knit with one strand knitpicks Suri Dream yarn and one strand cascade 220. This is the first time I’ve ever used US size 13 needles. I thought it would go very very quickly. It did not. I also developed a new callous on my finger, because using such large needles makes me hold them in a way that is unfamiliar to my hands. The modifications I made were that I did not cast off at the shoulder/neck seams. I chose to 3 needle bind off instead. Additionally, I used the held stitches around the neck to incorporate with the garter stitch collar in order that I did not have to sew.